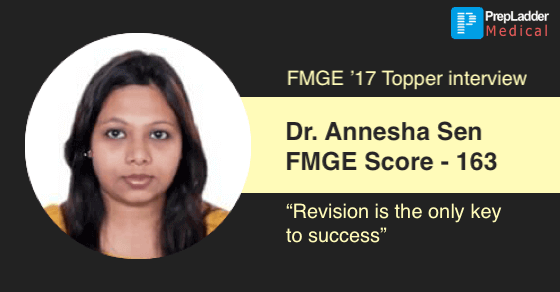 Hearty congratulation to Dr. Annesha Sen, for clearing FMGE December 2017 examination. We wish her all the best for her career and future ahead. In her interview with PrepLadder, she shares her experience and plan that worked for her the best and helped her score well in FMGE. I secured 163 marks in FMGE December, 2017. According to you what is the correct approach to study for FMGE ? Only MCQ's or Theory + MCQ's ? According to me theory must be completed initially, thereafter, go for MCQ’s. Well, I believe to crack any kind of competitive exam, one need to at least focus for 6 months with complete dedication and hard work. According to me, before exam usually one single book is sufficient to brush up everything at once. I prepared from FMGE solutions by Dr. Deepak Marwah. Also Read : How to Tackle Discriminative Questions in FMGE ? Is this your first attempt ? If No, what did you do different this year that lead to your success. No, it wasn’t my first attempt. This year I would say nothing different was there but one thing I learnt from previous year is that one just need to be focused to reach the goal. FMGE is not an easy exam. To hit the target, we just need to overcome the obstacles as they come in our way. What's the role of practice and revision while preparing for FMGE and how much time should be dedicated for it? I believe practice and revision play a very important role, one should dedicate 10 to 12 hours on daily basis and to be successful revision is the key. Did PrepLadder played a part in your success? If yes, how? Yes, PrepLadder played a very important role, Prepladder MCQ test series helped me a lot in clearing my concepts and memorizing. Did you followed a time table/study plan to keep your preparation on track? For me time table or study plan never worked well. I use to choose different subjects on daily basis according to my wish to study. Were you a topper or an average student during graduation? During my graduation I was an average student. Well, it depends from person to person. For me non-clinical subjects (like anatomy, biochemistry) are difficult because more mugging up is required in these subjects, whereas, I like to study clinical subjects because these were comparatively more interesting to study. While preparing for FMGE, most of the students might lose hope, one must believe himself and keep going. Some tips for our readers preparing for FMGE ? One must stay calm and keep working hard, until he reaches his goal. To be successful, revision is the only key. Hope the blog will inspire the future aspirants to work hard and grab their target with the help of the tips provided by Dr.Aneesha Sen.